Bob Kramer is arguably one of the greatest kitchen knifemakers of our time. His knives are the pinnacle of perfection. Each creation is a piece of art in its own right. A high performing tool laboriously crafted to almost impossible standards. Mr. Kramer's humble beginnings started in the kitchen as a cook with the realization that most chef's are not properly trained to sharpen their tools. Traveling the country, Mr. Kramer learned the skills necessary to take a damaged steel and transform it back into its original, razor-sharp form and a new business sharpening knives was born. After sharpening hundreds upon hundreds of knives, Mr. Kramer realized another truth: there is a lot of junk knives on the market. After enrolling in a forging class, Kramer Knives was born. Since then Bob Kramer have been recognized as a Mastersmith by the American Bladesmith Society and globably one of the best kitchen knifemaker. His knives soon began to be sought out by elite professionals and world leaders, bringing Kramer Knives to new heights. 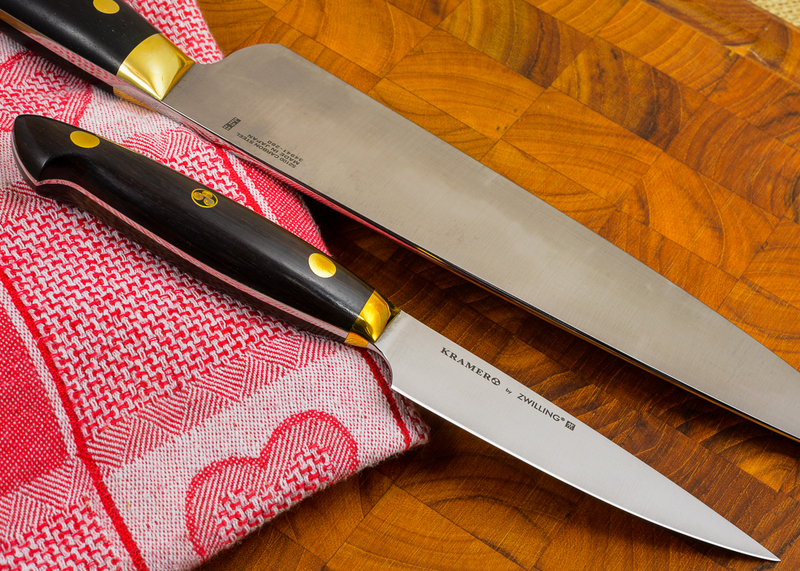 Because each knife is crafted by hand, Mr. Kramer creates very few knives per year. Working in partnership with knifemanufacture Zwilling / J. A Henckels, Bob Kramer introduces the Kramer Zwilling line of kitchen knives; a line of kitchen knives created with the exacting standards and optimal design of Mr. Kramer's custom kitchen knives - in Stainless Steel, Carbon Steel, and Damascus. You're going to love these knives.